I highly recommend this tour. It felt like we had friends on the island showing us around. We were able to see so much of the island, from a very informative tour of Akrotiri to a winery with an incredible view. We learned a lot of the island's history in a nice, relaxing manner. We had a professional photographer join us and take pictures in hidden streets and rooftops that we never could have found on our own. An absolutely perfect day! Eugenia was engaging and exceptionally well prepared as she led us on a tour of the ruins of Akrotiri--"the Pompeii of Greece," as she described it. 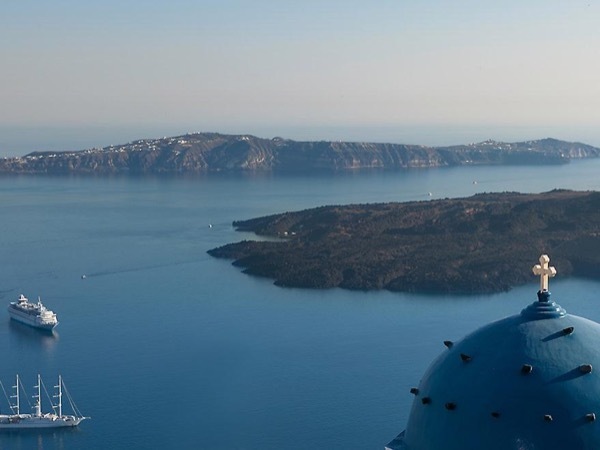 When I was planning our visit to Santorini, I learned that the island is Greece's main wine producer, so I emailed Eugenia and asked if she could arrange one or two winery visits and tastings. She customized our tour and made the arrangements for us--one of the reasons that I like using Tours By Locals. TOUR GUIDE RESPONSE: I can’t thank you enough for your kind words Michele and Larry! You were all so kind and enjoyable that I couldn’t have asked for a better company to enjoy such a beautiful day in Santorini!! My best wishes and I hope that our ways will cross again soon!! Our most memorable tour of a five week vacation. Eugenia was wonderful, knowledgeable and a delight to spend time with. Our tour through Akrotiri was an unexpected highlight. Eugenia's knowledge made the experience one of our favorites of all time. Bonus was meeting Christos Doumas, whose life work is the excavation at Akrotiri. Do not miss this wonderful discovery and you will love Eugenia. We were so fortunate that our first guide had to cancel and we ended up with Eugenia. TOUR GUIDE RESPONSE: Oh thank you so much for all your kind words. It really makes what I do so worthwhile. honestly I feel the lucky one to have met you ! You are by any means the kind of guests every guide would pray for!! I really hope you come back one day !! My very best wishes to all of you !!! Eugenia made our cruise stop in Santorini perfect. Eugenia and her driver were a pleasure. Very informative, knowledgeable, personable, and flexible to work with you to accomplish what you would like to do. A joy to be with, highly recommend! TOUR GUIDE RESPONSE: I can’t thank you enough for so much fun that I had with you !! Thank you too for your advises !! But I have to learn more from you so you just need to come back soon !! !My best wishes to both of you !!! Eugenia was great, highly recommend! Very customizable tour with wise timing to avoid touristy congestion. TOUR GUIDE RESPONSE: Thank you so much for your kind words !! I hope next time you will visit island we will be able to share a glass of wine together !!! My best wishes to both of you !!! TOUR GUIDE RESPONSE: Thank you so much for all you kind words ! I am really happy you enjoyed your visit I Santoríni !!! Maybe next we will drink together a glass of wine in New Zealand ��!!! Eugenia brought Santorini to life. It was like spending the day with a family member who went out of their way to make the day special. We saw the must sees and the out-of-the way places that only the locals know. It was the highlight of our and the only way to see Santorini is with Eugenia. TOUR GUIDE RESPONSE: Thank you so much Lori and John for all these kind words ! Making new friends , that you feel like family at the end of the day ,is the best reward for me as a guide . I can’t wait to see you again either here or in L.A ! Eugenia is a wonderful guide! The trip would not have been the same without her. She was on time, with a clean car and cold water. She is passionate about her tour and very knowledgeable. She is friendly and very accommodating. We highly recommend her! Eugenia is a pleasant and informative tour leader. She is good at adapting to our wishes and has many local contacts. And that makes the day special. We could not get a better tour guide on Santorini. TOUR GUIDE RESPONSE: I have no words to thank you for all your kind words !! With people like you I like to share my love and knowledge about my country . You know how to appreciate the beauties of the places you are visiting and that makes you a richer person ! My very best wishes for many more wonderful trips around the world !! Eugenia is a great guide. We had a wonderful day with her. She has a great knowledge of the island and knows how to share her passion. We highly recommend her. TOUR GUIDE RESPONSE: Thank you so much for visiting the island with me today !! I also learned so many new things from you !! I can’t wait to see you again soon!!! All my love to both of you and best of luck to the little princess!!! My family and I took a cruise with a stop in Santorini and hired Tours by Locals, Eugenia to show us Santorini! Eugenia made it our favorite tour ever! She was extremely knowledgeable, personable and accommodating! We enjoyed our trip to Oia but even more than that we enjoyed her flexibility in taking us off the beaten path and bringing us to a local restaurant and a quiet (no tourists!) village! My bucket list trip was the highlight of our 10 day vacation! Can't wait to book our trip back! TOUR GUIDE RESPONSE: Thank you all so much for the wonderful time I had with you in Santorini!! It makes me so happy to hear that you will be coming back ! !Gillian remember that next summer you have a job in Santorini ! We will guide your parents together in some more beautiful and off the beaten track places on the island !! My very best wishes and big hugs to all of you !!! Great tour. She brought Ankrotiri alive like no self guided or group visit could. Especially liked seeing Eugenia's own village instead of just the tourist areas. TOUR GUIDE RESPONSE: Thank you so much Mr Schwartz for visiting Santorini and especially my village!! I hope to see you again one day !!! My very best wishes to all of you !